Join us for two upcoming SPTF meetings! 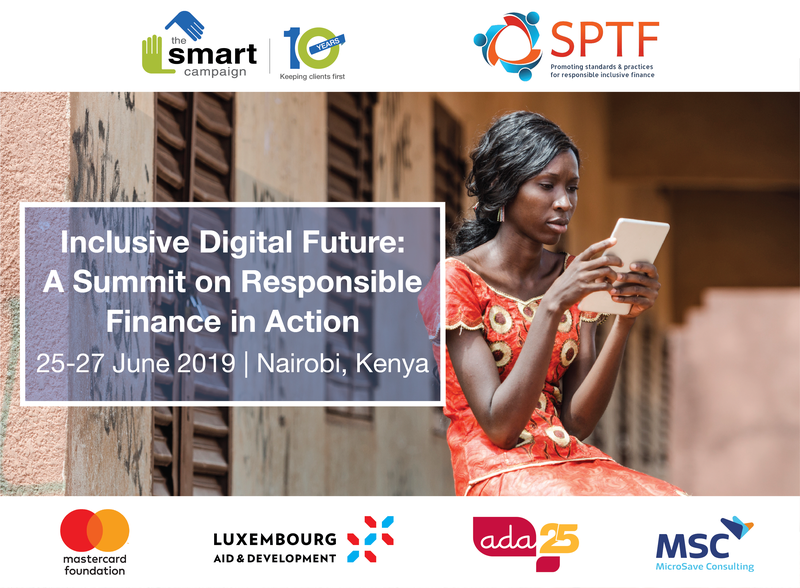 SPTF and the Smart Campaign invite you to join Inclusive Digital Future: A Summit on Responsible Finance in Action, which will take place in Nairobi, Kenya from June 25-27. Read more below. Investors are invited to join the SPTF Social Investor Working Group for its joint forum with IFC: Responsible Finance for Digital Inclusion: Investing for Impact, which will be held April 3-4 at IFC headquarters in Washington, D.C. Read more below. Join SPTF's next two Customer Empowerment Working Group online meetings! The April 16 meeting will discuss integration of customer empowerment into the Universal Standards, indicators for measurement, and field testing of new practices. The April 23 meeting will discuss action research, particularly the possibility of adding customer empowerment research into existing projects. For more information, email Anton Simanowitz at antons@socialperformance.net. Join this webinar, which draws on CGAP's Customer Analytics Toolkit, to explore various sources of customer data, learn how to use transactional data to build customer insights for diagnosing current problems and recognizing future opportunities. The webinar will help financial service providers think about their customer analytics journey and identify key customer-related questions that can be answered with an analytical approach. Early bird registration is available now for the Microfinance Centre's (MFC) Annual Conference, which will focus on "Demystifying Digital in Microfinance." The conference will use case studies, trend analysis and emerging best practices to address the practical side of digitalization. SPTF will lead a session on how investors and networks can support MFIs in digital transformation. Early bird registration closes March 31. African Microfinance Week, known as the Semaine Africaine de la Microfinance or "SAM," is a conference organized by ADA dedicated to the development of financial inclusion in Africa. SPTF will organize three full-day events during the week: a peer-learning session for auditors on the SPI4 audit tool, a training on digital transformation, and an SPM training with special modules on client outcomes, integrating SPM into DFS, and SPTF's upcoming activities. For more information, email Amelia Greenberg at ameliagreenberg@sptf.info. SPTF and the Smart Campaign are pleased to invite you to their joint summit in Nairobi, Inclusive Digital Future: A Summit on Responsible Finance in Action, from June 25-27. Over the course of this three-day international forum -- organized in partnership with MSC (MicroSave Consulting) and ADA -- we will confront the most pressing financial inclusion question of the day: How do we promote inclusion and trust in digital financial services while fostering innovation and growth? The gathering will bring together financial service providers, investors, and DFS experts for two days of trainings, panels, and interactive breakout discussions, capped off by field visits to leading Kenyan institutions engaged in digital transformation. Read our full event agenda here. Register early! To create space for in-depth discussion and connection among participants, registration for this event is limited. Space is expected to fill up and early registration is encouraged. Register early to receive discounted registration! Reserve your lodging here at reduced rates. Input your check-in/check-out dates then select "STANDARD ROOM" twice for the preferred SPTF rate. Visit our event webpage for important visa instructions. E-visa applicants can apply next week, and participants requiring a "Category 3-Referral Visa" should apply now. Join SPTF in DC for its annual investor meeting! An updated agenda for the upcoming IFC and SPTF Social Investor Working Group Investor Forum -- Responsible Finance for Digital Inclusion: Investing for Impact -- is now available here. The Forum, which is open to investors only, will be held April 3-4, 2019 at IFC's headquarters in Washington, D.C. Registration is available here. Participants will have an opportunity to share investment lessons in social performance and impact management, discuss recent strategies for digital transformation, and share the latest developments in impact investing tools for financial inclusion and the larger impact space, which are critical to achieving the UN's Sustainable Development Goals (SDGs). The meeting will also include deep-dive sessions about how investors in financial inclusion and digital financial services (DFS) can assess and manage risks in the rapidly evolving digital finance landscape. Discussions will include the latest initiatives among co-founding and new signatories of the Guidelines for Investing in Responsible Digital Financial Services and their importance for impact investing. Visit the SPTF Social Investor Working Group website for continued updates. Email Katie Hoffman at katiehoffmann@sptf.info for more information. SPTF is pleased to announce that it has opened a European entity at the House of Microfinance in Luxembourg. Already a long-time collaborator with the Luxembourg-based actors in the microfinance sector, SPTF now has an established presence in the Grand Duchy through the creation of a non-profit association -- SPTF Europe -- which is funded by the Luxembourg Ministries of Finance and Development Cooperation. Jürgen Hammer will serve as the Managing Director of SPTF Europe. 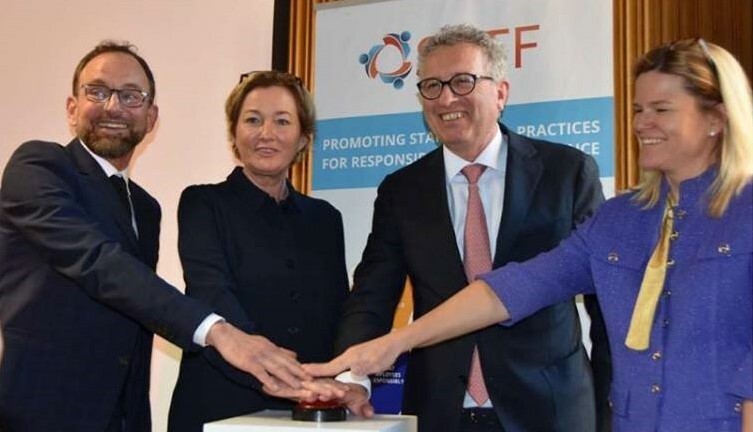 Last month, SPTF Europe held a launch party in Luxembourg, which was attended by Pierre Gramegna, Minister of Finance, and Paulette Lenert, Minister for Development Cooperation and Humanitarian Affairs. "The goal of creating a positive social and environmental impact through closer cooperation with the financial sector is at the heart of our new development strategy," said Minister Lenert. "Our commitment to key players, such as SPTF, will enable us to make a greater contribution to sustainable development goals than we would expect from a country of our size." Responsible Microfinance Facility (RMF) for Africa and the Middle East. Funded by the Agence Française de Développement (AFD), with additional project funding from the Government of Luxembourg via the European Investment Bank (EIB). To learn more about the facility, visit its webpage. The next application deadline is June 19. Responsible Inclusive Finance Facility for Central America and the Caribbean (RIFF-CAC). Funded by the Swiss Agency for Development and Cooperation (SDC), with additional project funding from the Government of Luxembourg via the European Investment Bank (EIB). To learn more about the facility, visit its webpage. The next application deadline is June 21. Responsible Inclusive Finance Facility for Southeast Asia (RIFF-SEA). Funded by the Ministry of Foreign and European Affairs of Luxembourg. To learn more about the facility, visit its webpage. The next application deadline is March 22. The 2019 European Microfinance Award -- "Strengthening Resilience to Climate Change" -- is now open to all organizations active in the financial inclusion sector that provide products and services to help vulnerable communities become more resilient to the effects of climate change. This year, eligibility has been broadened to include non-financial institutions that collaborate with financial service providers. Applications are due April 9 at 23:59 p.m. CET. For more information, visit the European Microfinance Award website. Applications are now available for BBVA EduFin Research Grants, which focus on financial education-related topics with a worldwide reach. This year the grants will particularly focus on topics related to: digitalization as a driving force behind financial education; financial education and poverty; the lack of confidence in financial institutions as promoters of financial education; and evaluation of financial education strategies. Applications are due by April 25 at 11:59 p.m. EDT. For more information, visit the website. The Truelift Steering Committee has announced that AMK Microfinance of Cambodia has received a Leader Milestone, the highest recognition of Truelift's pathway of pro-poor performance. SPTF congratulates AMK on this achievement!